lleghany County is located in the heart of the Blue Ridge Mountains of northwestern North Carolina, adjoining the Virginia state line. The county was organized in 1859 from Ashe County. The name "Alleghany" comes from an Indian word meaning "good river." Alleghany County is without a doubt one most beautiful places in America, with 235 square miles of forested ridges, round stony peaks, and deeply eroded river bottoms that reflect its ancient geological past. 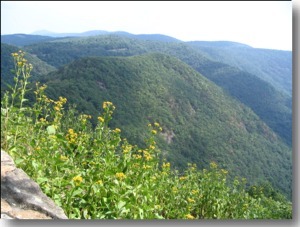 One of the most important geologic features in this part of the country is the "Dividing Ridge"the crest of the Blue Ridge Mountainsthat lies between Alleghany County and Wilkes County. South of the Dividing Ridge (Wilkes County), streams flow south to the Yadkin River, which joins the Pedee and eventually reaches the Atlantic Ocean. North of the dividing ridge (Alleghany County), streams flow north and west to the New River. And the New River is an eccentric girl. She journeys north, joining the Kanawha, the Ohio, and finally the Mississippi, which carries her waters south to the Gulf of Mexico. Rain on Bald Knob in Alleghany County eventually flows past a riverboat casino in New Orleans. European trappers and explorers first came to North Carolina's Upper New River Valley in the mid-1700's. In October 1749, the famous mapmakers Joshua Fry and Peter Jefferson, along with William Churton and Daniel Weldon, surveyed the state line for 90 miles westward from Peters Creek in Surry County to Steep Rock on the western side of the New River Valley, where they were forced to turn back because of severe weather and lack of food for their horses. Governor Gabriel Johnston reported that the expedition had "crossed a large branch of the Mississippi which runs between the the ledges of the mountains that nobody ever dreamt of before." (J.G. Hollingsworth, History of Surry County, or, Annals of Northwest North Carolina, Ch. 2 (1935). Despite Bishop Spagenburg's glowing description, few Europeans tried to make permanent settlements in the Upper New River Valley until the Cherokee and Shawnee people were driven out of the area in the 1770's. This tragic episode in American history is discussed on The History of the Cherokee website. The first part of the Revolutionary War in the upper New River Valley was really a war against the Cherokee, who had hoped to resist further European encroachment by forming an alliance with the British. According to local historian Jeff Weaver, in 1782 there were only 34 documented families (around 215 people) living beyond the crest of the Blue Ridge Mountains in what was then Wilkes County (now Ashe, Alleghany and Watauga Counties). After the Revolution ended, new settlers rushed westward to take advantage of low-cost land grants offered by the government of North Carolina, which had seized a vast territory from the British. Many of the migrants were Scotch-Irish and Germans who came down the "Great Wagon Road" from Pennsylvania. Others were descendants of English colonists in Virginia and the central and eastern parts of North Carolina. By 1790, there were 1,006 people (160 families) west of the Blue Ridge in Wilkes County. In 1800, the newly formed county of Ashe recorded a population of 2,785 (435 families). As the population in outlying territories increased, new counties had to be established to provide vital government services such as recording deeds and land grants, ordering road construction, and running the court system. (Americans were just as fond of lawsuits 200 years ago as they are today.) Surry County was established in 1770 from Rowan County. In 1779, the western part of Surry County became Wilkes County. The northern section of Wilkes County became Ashe County in 1799. Finally, the eastern part of Ashe County became Alleghany County in 1859. 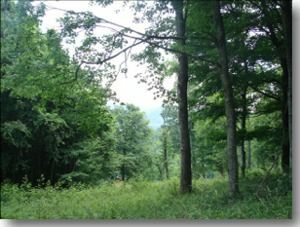 "It seems that there were no settlers in Alleghany prior to the Revolutionary War; but it had been visited by hunters both from Virginia and the central part of this State, among whom were three brothers named Maynard from what is now Surry, who crossed the Blue Ridge and built cabins along Glade creek. This was about 1786, and they had lived there about six years when Francis Bryan, from Orange county, in 1793, located within five miles of them. About the same time Joel Simmons, Wm. Woodruff and __ Crouce [Crouse] settled along the top of the Blue Ridge, thus making seven families in the county. But this was too much for the Maynard brothers, and claiming that the country was too thickly settled, they moved to Kentucky. But who was the first white man to visit this section is unknown; though Wm. Taylor, the Coxes, Gambills and Reeves probably lived in the borders of what is now Alleghany during the Revolutionary War. Two men named Edwards settled here also at an early date, viz: David and William Edwards. John McMillan came from Scotland in 1790 and was the first clerk of Ashe court. Joseph Doughton from Franklin county, Va., was an early settler, and represented Ashe in the House of Commons in 1877." By the eve of the Civil War, the people of Alleghany County had created a prosperous mountain community. The predominent occupation was subsistence farming and related skills and crafts. Most of the inhabitants were now Baptists. Their ancestors had been Anglicans, Presbyterians, Quakers, and members of German churches like the Moravians and Dutch Reformed, but the Baptist faith spread like wildfire during the "Great Awakening" period in the early 1800's. Today there are several different kinds of Baptists in Alleghany County, including Primitive or "Old School" Baptists, Missionary ("New School") Baptists, Regular Baptists, and Union Baptists. New Baptist sects often emerged because of doctrinal disputes over religious matters such as free will versus predestination, or whether to support missionary activities. The Union Baptist Churches were organized during the Civil War by opponents of secession. Controversy over the Civil War led to violence and even murder, as told in the book, Mountain Mourning by Cyrus Stoneman. The years after the Civil War were difficult, with the Southern economy devastated and so many young men dead or maimed. Nearly every family in Alleghany County lost a son in the war. In total, about one-third of the military-aged men in North Carolina died in the Civil War, a staggering loss that would be the equivalent of millions of deaths today. * After the Civil War, migration into Alleghany County virtually ceased. Roads deteriorated and people withdrew into their own communities. People began to joke that the only way to get to Alleghany County was to be born there. By the early 20th century, Alleghany had earned a reputation as the "Lost Province" of North Carolina. This didn't really change until the 1930's when the Blue Ridge Parkway was constructed, which opened the mountains to jobs and tourists. But Alleghany County had only been "lost" to the outside world. Behind the walls of the mountains, there was a thriving society founded on values of family, religion, hard work, and self-sufficiency. *According to the North Carolina Civil War Sesquicentennial webpage, 40,275 soldiers from North Carolina died in the Civil War, including 19,673 in battle and another 20,602 due to injury or disease. In the 1860 census, the total population of white males in North Carolina between the ages of 15 and 39 was 115,347 (see the Historical Census Browser , an on-line service of the Library of Virginia). 40,275/115,347 = 34.9%. Today, Alleghany County still has few towns of any size, and nothing that would qualify as a city. The county seat, Sparta, had about 1,800 inhabitants in the year 2000 census. Historically, most of the "towns" consisted of little more than a post office with perhaps a church, school, or general store to serve the surrounding farm communtiy. For government purposes, such the census, the county has traditionally been divided into "townships." There were five such townships in the 1870 census: Prather's Creek, Piney Creek, Gap Civil, Glade Creek, and Cherry Lane. Cranberry Township (formerly part of Prather's Creek) first appeared in the 1880 census. Whitehead Township (formerly part of Gap Civil) was added by 1900.